Call center workers in New York overcame a brutal yet predictable anti-union campaign, but are stuck as managers stall first-contract talks. Workers aren't waiting for the labor board to respond, and took their fight directly to management Friday. Photo: Kate Doehring. More than a year ago a few courageous call center workers in New York City contacted the Communications Workers (CWA) to form a union. Workers started organizing after they grew tired of being yelled at like children, demeaned, and being denied raises if they weren’t management’s favorites. Within a few weeks, a 30-person organizing committee of E-Z Pass workers was formed to reach out to the 300 workers at a call center in Staten Island. They survived an all-too-common anti-union campaign and voted up the union, but are stuck as management plays endless stalling games. Management appealed the election results and lost at the regional labor board. But the National Labor Relations Board (NLRB) is unable to resolve management’s legal challenges. It’s hobbled by extensive delays as the Senate dithers, leaving open three of five seats on the board. So workers, sick of waiting, mounted a rally Friday to encourage fair bargaining as their employer contemplates a merger. The employer is ACS, or Affiliated Computer Services—the biggest company you’ve never heard of—a $6 billion goliath. It’s slated to be sold to Xerox by the end of March. ACS is contracted by the Metropolitan Transit Authority (MTA), Thruway Authority, and Port Authority of New York and New Jersey to administer the E-Z Pass electronic toll system in New York state. ACS ran a brutal yet predictable anti-union campaign within 48 hours after the workers decided to “go public.” Spying, intimidation, threats, and forced anti-union meetings were soon followed by a stream of suits flying into Staten Island to further badger the workers. Despite such obstacles, the workers held together and voted to join CWA Local 1102 on May 28. The election was certified by the NLRB in early August. But to date, ACS continues to refuse to bargain with CWA even though legally they are required to do so. Meanwhile Massachusetts’ newly elected Senator Scott Brown demanded to be seated Friday to thwart the confirmation of Craig Becker to the labor board—giving managers at ACS and thousands of other anti-union firms yet more months to press their baseless legal claims. The long-delayed Employee Free Choice Act, of course, would end these delay tactics by forcing management into arbitration for a first contract. Shortly after the workers voted in the union, ACS instituted a new pay-per-call scheme called Activity Based Compensation. Now workers at the call center are paid approximately 87 cents per call. They do not get a consistent hourly rate, and customer service is eroding because workers have an incentive to rush customers off the phone in order to get to their next call. ACS is refusing to bargain over the effects of pay-per-call and a complaint has been issued from the NLRB. One of the effects of pay-per-call system is that the call center stopped taking calls in Spanish. Spanish-language calls take longer to process, so the 16 bilingual workers taking Spanish calls were forced to choose between their customers and their rent. Instead of fixing the problem ACS decided to let the entire Spanish-language customer support disappear, discriminating against more than 3 million Spanish speakers in the state. The MTA, Thruway Authority, and Port Authority’s contract with ACS to administer E-ZPass is worth more than $200 million. More than 90 New York State elected officials, including Governor David Paterson and Senator Kirsten Gillibrand, are pressuring the authorities to protect the workers at the call center and their customers by forcing ACS to settle a fair contract. Legislation and more embarrassing public protests are on the way for ACS. As Xerox hurtles toward purchasing ACS, it should consider the mess it’s inheriting. The workers are fighting hard for a fair first contract—and will keep fighting. Kate Doehring is a campaign coordinator with CWA’s District 1. To find out more, please visit the website www.NOTSOFASTEZPASS.org. I have 1 year experience in BPO industry and I must agree that being yelled at, demeaned, and being denied raises if not a management’s favorite, - all this was such a frequent occurrence in our day-to-day work life. Besides, these cases were reinforced by management legal and illegal coercive tactics, and the ineffectiveness of current labor law to protect and enforce workers’ rights. For their part, employees try to unite to defend their rights, but employers continue to punish workers for supporting a union. 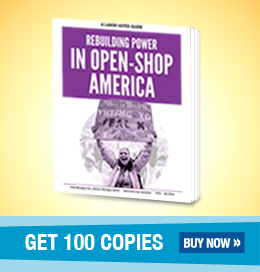 There are several good articles on this topic at http://www.sharedshares.com/?x=1&q=work+unions that also clarify the glaring problems that block workers from exercising their freedom to organize and bargain for a better life. "Legislation and more embarrassing public protests are on the way for ACS. As Xerox hurtles toward purchasing ACS, it should consider the mess it’s inheriting. The workers are fighting hard for a fair first contract—and will keep fighting." This is good news. I am so tired of seeing hopeless workers on the front page. I wish we lived in a country where people are paid what they are worth, and not what the company things is acceptable. Budget cuts are a sign of the times. Heck, you are lucky to have a full-time job with benefits . How was this situation resolved? They are still fighting GM in Indiana over the pay cuts all workers are expected to take if they re-open one of the plants. Unfortunately, they CAN send the business somewhere else so now the union has to decide whether or not working for less than they USED to make is worth the job in the first place. I wish everyone involved all the best.